ai weiwei musste sich heute in münchen einer notoperation unterziehen. hier die hintergründe: Am 12. August hielt sich Ai Weiwei in Chengdu auf, um den angeklagten bürgeranwalt Tan Zuoren durch seine Zeugenaussage vor Gericht zu verteidigen. Tan Zuoren war angeklagt worden, weil er sich für eine Untersuchung der zahlreichen bei dem Erdbeben in Sichuan eingestürzten Schulgebäude eingesetzt hatte (korruptionsverdacht gegen lokale beamte bei der bauvergabe der schulen; über 4000 schüler starben bei dem erdbeben). am tag der angesetzten verhandlung, Um drei uhr nachts, brachen über 30 bewaffnete Polizisten in Ai Weiweis Hotelzimmer ein und nahmen ihn fest, damit er nicht am Gerichtsprozess teilnehmen konnte. bei seiner verhaftung, die er über twitter dokumentieren konnte, wurde ai weiwei von polizisten verprügelt. die erlittene Misshandlung hatte Spätfolgen: Ai Weiwei musste wegen eines Hämatoms in der rechten schädelhälfte notoperiert werden. er wird noch ca. eine woche im krankenhaus bleiben. die ausstellung wird aber pünktlich am 11 okt 09 eröffnen. Ai weiwei dokumentiert alles, was er erlebt, mit seinem handy und publiziert die fotos über twitter oder sein blog im internet. so schafft er öffentlichkeit und sichtbarkeit in china, dessen politische führung er scharf kritisiert. das foto wurde auf ai weiweis wunsch im krankenhaus gemacht und bereits im chinesischen blog publiziert. haben gerade Eure Pressemitteilung bekommen und auch live gestellt. Gute Besserung und wir freuen uns auf die Ausstellung. thank you for visiting germany! thanks also for your very impressive art and for your research and the interviews you did in the earthquake area. it’s good to have someone like you in germnay. all the best and keep on running! 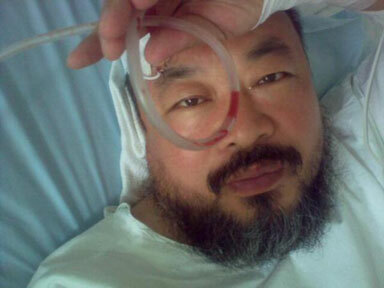 A big thank you to the people at hausderkunst for helping Mr Ai Weiwei. Artists like this that have the courage to stand up for the truth are rare and need a platform like yours. thank you for your courage and contribution to your country China. May you regain full health soon and continue safely on your road to freedom. You have given hope to many people and have brought clarity to the situation in China. Because of people like you it is clear that this is not a battle against the people of China but a battle between good and bad ! May your country be free and may the people of China be able to live without fear and pain. Vielen Danke für Ihren Mut und Ihre Kunst! Wo finde ich die Namen der Kinder aus Sichuan, die beim Erdbeben gestorben sind und die Ai Wei Wei zusammengestellt haben? Der blog wurde ja insoweit von der chinesischen Regierung gelöscht. Die Liste der Namen wird voraussichtlich Ende November in der “Zeit” veröffentlicht! As many people i’m impressed by your courage in fight for freedom of expression. I hope for your good recovery and for your safety. Let truth never be hidden again. Free China, free Tibet, free world from the China’s Comunist Party! the public art group “die urbanauten” will be staging a series of public happenings that are coordinated via SMS (text messages) and will be blogged live during the happenings. We just thought it might be interesting for you to take part as we are very impressed by your excursions into the virtual and heared, that you will be in the country or even in town for a while. The art- and theatreproject will take place in Munich in November 2009 (starting November 3rd). It is funded by the culture department of the City of Munich and is part of the SPIELART – theatre festival. More about the project can be found – where else could it be – on the blog of the project: http://www.blog.urbanaut.org. Taking part is generally possible with german mobile phones. But if you you were interested in taking part, we could certainly try to arrange something as it would be a great pleasure to have you join us in this urban experiment. Especially the first happening an November 3rd might be especially interesting to you, as it will be staged together with the group Improv Everywhere from New York. You can reach us via mobile phone 0179 – 49 34 578 from germany or in our office 089 – 5 18 18 740.
today I saw your great art in munich. great! great! very great! I started thinking and understanding – about your country. thank you for this experience and reflection! dear ai wei wei, it is very long ago that I saw an art exhibition which impressed me so much! in deed, you demonstrate, that marcel duchamps has posed his very very best seets in your -and only in your- brain! a chinese man is the best artist in the world in this moment – i hope that your government is able to understand that this as a big chance ! thanks to you and your family being like that and many greetings to the cats and dogs in your house from my cat and my dog- they live in the same way in my house like yours do. It is noot the message that is what acjievement is all about. It is not even what history says. It is about method. Keep the line you befgan with… the metod of inquirery through dialogue, and even mistakes , enevitable as they are, will be correct because they have been arrived at with the correct method. Dear Ai Weiwei, I have watched your interview on Amanpour several times. My congratulations to your art and to your dedication to a humane society around the world. I am a non-commercil painter, and would love to feature you and your art on a special section on my website, if you would agree. Here is the site: http://www.karl-maenz.com . I would be very honored, to have your input, up to you, preferably a suitable text of your beliefs, your portrait and a selection of your works in jpg format.